The summer is the perfect season to spend some time out in the wilderness. Taking advantage of the good weather usually leads to an organized weekend away from the city. This means packing up some supplies and loading up the car. Sandwiches can work but nothing beats a hot cooked meal next to a tent. 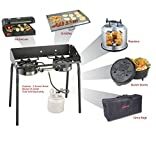 One of the best options is to get a camping grill stove. They are usually compact, easy to carry and good enough to cook food even for a small family. A reliable stove can allow someone to cook anything from a hearty stew to steaks or even a simple hot cup of coffee. 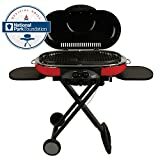 Camping grill stoves are usually powered by some sort of fuel and there can be different types of stoves. Since there are so many to choose from, we trimmed down the list to just 10 stoves that are suitable for camping. To keep things short, here is our list of picks for the top 10 best camping grill stoves. 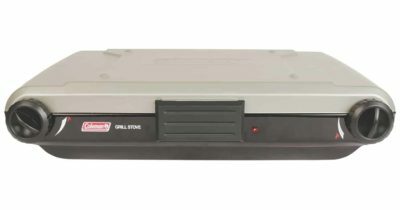 GasOne GS-2000 portable stove is a great pick for the ones that are looking for a practical product on which they can cook a full meal like they would at home. It is quite compact but not as lightweight as some would like. The stove is a dual fuel model and can work with 2 propane tanks. It has an auto-ignition system which means that it eliminates the need of having something like a lighter or matches around. The stove itself is made mostly from stainless steel which makes it durable and easy to clean. The cooking surface of the grill has a non-stick coating. As the grill is removable, it can be converted into a conventional stove. A bonus feature is the cartridge ejection system that was designed to prevent gas leaks. 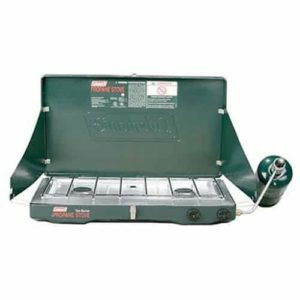 Basecamp double burner is a simple stove with a reasonable price tag and a practical design. It was meant to be used mostly by the ones that are into camping and want to pack as light as possible without leaving out any of the essentials. Like any other stove, the Basecamp is powered by regular propane tanks. Each burner offers a heat output of 15,000 BTU for a total of 30,000 BTU. It has a simple grill over it like any other stove and it is reasonably easy to maintain clean. As far as practicality goes, the stove comes with adjustable legs so that it can be used on any type of terrain. The frame is welded properly and has a thick gas manifold system. It is corrosion resistant and has brass valves. Coleman Camp Grill/Stove+ was specifically designed to be easy to travel with. It has a very slim profile when packed and it is not that heavy. Practicality is its major strength despite the modest price tag and simple setup. With two burners, the stove offers a heat output of 20,000 BTU. Due to its design, the Coleman can be used as a stove and grill at the same time. The left side has a classic stove burner while the right side is made to be used as a grill. To make it even more practical, the stove has a simple push-button ignition and works with standard gas tanks. It is easy to clean as the grills are removable and can be used on all types of surfaces. Additionally, the model comes with side wind blockers to help shield the burners. Coleman camp propane grill is an essential item that should not be missing from the arsenal of anyone that loves to spend time out and away from the city. It is very compact, easy to use and easy to carry. It is also inexpensive but well-built and reliable. Looking at the design of the grill, the model has a single burner that offers a heat output of 11,000 BTU. 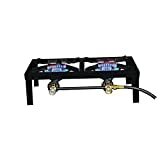 It works with regular propane tanks and they are very easy to install without having any kind of leaks. 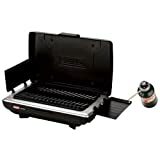 According to Coleman, the camp propane grill has a ProtectHeat design which helps it preserve heat for efficient cooking while using less heat. The cooking area is about 180 square inches and it is very easy to clean. The porcelain-coated grade prevents food from sticking while the raised edges prevent spills. 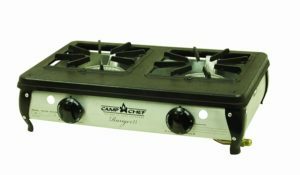 Camp Chef Ranger II stove can be used as a regular patio grill, but it is portable enough to be used as a regular camping stove. It is not that large and easy to setup. It works on regular propane tanks and has a match-less ignition. To improve durability, the burners were made from cast aluminum. They are quite easy to clean and lighter than steel. It includes a 5-foot hose for the propane tank which will make it easier to conceal when using it as a regular patio grill. The stove features two individual burners capable of a heat output of 34,000 BTUs. It is powerful enough to cook any type of meal even while camping. It manages to be lightweight despite being made entirely out of metal. Coleman Triton 2-burner propane stove is more of a general-purpose product that can be used for both campings or as a tabletop burner. It has a simple design with a top lid and steel grates. It also has two additional side walls to prevent wind from blowing into the burners, but it still works well. Like most other stoves in our list, it is powered by standard propane tanks. It has a simple system that prevents gas leaks and uses PerfectHeat technology which saves fuel for more efficient cooking. As far as cooking power goes, the stove has a heat output of 22,000 BTUs. The griddle is sold separately but it is not necessary. Even if it is not that large, the stove is big enough for regular 12 and 10-inch pans. 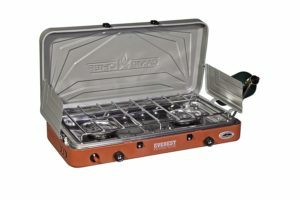 Camp Chef Everest camping stove is a great companion for the ones that are looking for something reliable to enjoy a hot, freshly cooked meal while being away from the city. It is a compact stove made mostly out of metal and with a convenient carry handle. Cooking surface is fairly generous. Also, cooking power is enough for a camping stove. It has a heat output of up to 20,000 BTU for the two burners. Both of them are protected by a steel grate that can be removed, making it easier to clean. As far as practicality goes, the stove has a self-ignition button. It also has two side walls that protect the burners from the wind. Also, it has a stainless steel drip tray that is easy to clean. It is a bit heavy, but it is quite compact. Camp Chef Explorer stove is more of a general purpose model that can be used for camping or even in the backyard. 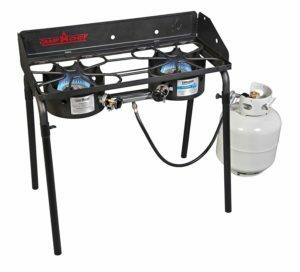 It works with regular propane tanks and it is very easy to setup. Unlike other stoves on our list, this model comes with aluminum legs which makes it easier to cook on the stove. The legs of the stove are removable to make it easier to pack. It has side walls that prevent wind from blowing directly into the burners and two knobs to adjust each individual burner. The stove is not that heavy and does not take a lot of storage space. When it comes to cooking on the stove, having legs does add some degree of convenience. The burners are large and the grate over them is easy to clean. The two burners combined offer a heat output of up to 30,000 BTU which should be enough. 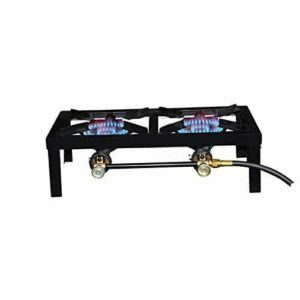 Coleman classic propane stove manages to sell well mainly due to its simplicity. It has a slim profile with a metal cover and folding side walls. The side walls can be fixed into place so that they provide better protection for the burners when the wind blows from the sides. Like most Coleman stoves, the model has PerfectFlow and PerfectHeat technologies which basically translate into less propane consumption. It is built to use less fuel and work even in the most extreme weather conditions. As far as cooking power goes, the two burners offer a heat output of 20,000 BTU. Each burner can be controlled individually and the covering grate can be removed so that it is easier to clean. The stove is reasonably compact but it can fit regular 12 and 10-inch pans. Coleman Road Trip propane portable grill LXE was specifically designed for the ones that love camping. Unlike other portable grills, this particular model comes with legs and caster wheels. It can be folded so that it is easy to store and has a small handle so that it can be pulled around. The grill is removable so that it can be cleaned easier but it can also be used like a regular stove. 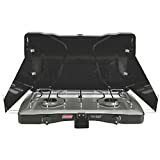 It has 2 individual burners that offer a heating power of 20,000 BTU over cooking surface of 285 square inches and each burner can be adjusted individually. Practicality is impressive for the LXE grill. It has two sliding side trays that can be used as cooking space. Almost everything folds in such a way that it takes very little space when transporting the grill. 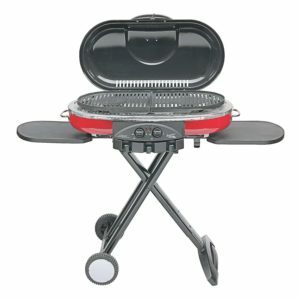 Picking a good and reliable camping grill or stove can be a bit time consuming mainly because there are so many different models to look at. Shortage of diversity will not be an issue and most of them appear to be similar. Practicality is important and the main thing that separates a camping grill from a regular one. Just to be sure that you are spending on something that is actually useful when going out camping, it is important to look out for several different aspects. Here are some pointers on what makes a camping grill worth spending money on. Practicality. Usually, practicality is the most important aspect. A camping grill needs to be easy to carry and take very little space. This means that some trays or wheels if the model has any, need to be foldable. Heat power. Camping grills usually have 10,000 BTU heat output per burner. It can be higher than that and usually, most brand clearly states this value. Fuel. Since they are camping grills or stoves, they need to be powered by propane. Most of them work with standard propane tanks. The vast majority of camping grill stoves that were picked for our list were designed to be compact and practical. At the same time, they work with regular 12 and 10-inch pans thus, cooking on them for reasonably large groups should not be an issue. What is equally important besides practicality is to have a reliable supply of propane. 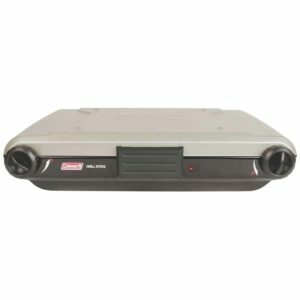 There are small tanks that are specifically made for camping and there are stoves that have special designs so that they do not waste fuel and remain as efficient as possible. In the end, if the grill or stove is well made, it can make cooking as easy as it would be with a regular stove.